My degree is in Computer Science, which is one of the growing points on the tree of Mathematics. But like everyone else, I suffered through high school Geometry thinking, "I'm never going to use this stuff... why are they teaching it?" The L.W.L., or Load Waterline, for example, shows where the surface of the water will be, when the boat is floating. The Floor Line shows where my basement floor will be, when the boat is built upside down. The vertical lines on the lofting grid are called stations. Station A shows where the absolute front of the boat is. If you held a straight edge vertically at station A, the bow of the imaginary boat would just kiss it's edge. Likewise, station S shows the absolute back of the boat. Station 0 shows where the bow of the boat will slip into the water. Station 5 shows where the stern will emerge from the water. And the strong wooden forms, that Cabin Boy will be built on, will be positioned on my basement floor at stations 1, 2, 3, and 4. In other words, there is nothing abstract about the lofting grid. Any errors I make in the grid will physically distort the shape of my boat. 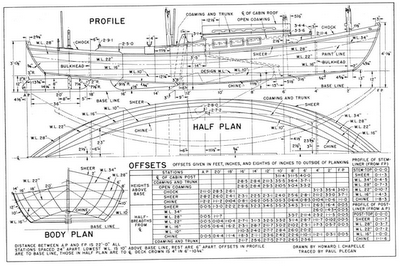 If the lines are not parallel to each other, and the proper distance apart, the boat I build will not be Cabin Boy, but some other boat, designed not by the hand of John Atkin, but by the ugly, misshaping hand of Error. There are lots of ways to draw a lofting grid. Probably the simplest method is to snap a chalk line near the bottom of the lofting board and call it the Base Line. 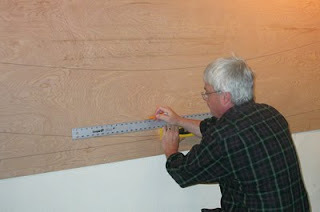 If you nail a long strip of wood (called a batten in boat-speak) along the Base Line, then you can use a large steel carpenter's square to measure off and draw in the vertical lines. Once you have them perfectly vertical, it should be simple to measure up the verticals to draw in the L.W.L. and Floor Line. Easy peasy, and probably pretty accurate. While I was using my 1 ft. plastic spirit level to erect my lofting board, it had occurred to me that I could use the same spirit level to draw perfectly horizontal and vertical grid lines. This won't work for builders who loft on the floor. But because I had a vertical lofting board, I had gravity in my tool box. The same force that kept planets in their orbits could be used to draw my lofting grid easily and accurately. After all, what could be more accurate than gravity? Close up of my spirit level, perfectly level. This technique was a bit trickier than it first seemed. As illustrated in the photo below, it took a bit of juggling to balance a long ruler on top of my spirit level, while drawing a pencil line... all the time keeping a slippery bubble in it's place. Nevertheless, too stubborn for my own good, I persisted, and managed to draw both the Profile and Body Plan grids using this technique. When I was done, all the grid lines looked perfect. It wasn't until I started laying out the lines for the Body Plan that I realized something was wrong. The Body Plan lines, projected onto the Floor Line amplified my errors. All the lines were off by a 1/4" or 1/2". Far to big to ignore. I had done something wrong. I remeasured all the offsets, but they were correct. The only thing left was the grid. When I measured the distance from the Floor Line to the L.W.L. at one end of the grid, and compared it to the distance at the other end of the grid, I realized that they were not parallel... not even close. So how could two lines that were perfectly level, as measured (again) by my yellow plastic spirit level, not be parallel? In other words, how could gravity be wrong? I'm sure experienced wood workers smelled the problem as soon as they saw the photo of my spirit level. 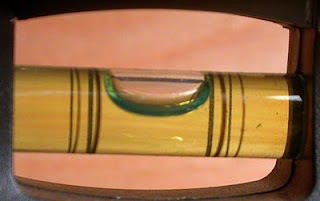 In a quality, precision spirit level, the ends of the bubble line up exactly with both lines on the glass when leveled. My cheap plastic level had a good 1/8" gap between the bubble and the lines, on both sides. That left plenty of room for error. A quick calculation told me that even if I was able to measure level to within 1/4th of a degree, that tiny error projected over the 8 ft. length of my lofting grid translates into almost a .5 inch error. Clearly not good enough. After kicking the basement wall a few times, I realized that it was time to refactor, as we say in the programming world. In English, that means take out the old eraser, and try again. Who told you to buy a T-Square?? WHO??? Did you already fix it? Is this problem already solved? Maybe you should buy a laser leveler. I see them on TV all the time. No room for error in a laser! I revised that section of the blog and hopefully it's more clear than it was. I did solve the problem (see next post). A laser leveler is an interesting idea, but I got into this trouble because I kinda like the idea of building with what I have, rather than buying a bunch of tools. I thought part of the point of building something was buying new toys? I am new to your blog but very very old to woodworking and I know one thing for sure-having a basic set of good tools is essential for producing good work. While frugality is laudable in some situations, a square (perhaps two-framing and sliding bevel types) are not optional.